WTF: How Did Rock Point School Get Its Stained-Glass Windows? Lone Rock Point, a mostly wooded peninsula jutting into Lake Champlain two miles north of downtown Burlington, remains unfamiliar to many locals despite its intriguing history. For starters, a couple of the city's most stately 19th-century buildings stand there. One of them contains a group of stained-glass windows that even most visitors to Rock Point have never seen. That's a particular pity, since, besides being flat-out beautiful, the windows demand attention as 100-year-old expressions of proto-feminist artistry. Larry Ribbecke, a Burlington-based designer and restorer of stained glass, ranks the quality of the windows in the chapel of Bishop Hopkins Hall among the highest of those he's seen during a 40-year career. Although the master craftsman has worked on those unsigned windows a number of times, he says he has no idea who made them. Neither does John Rouleau, a former headmaster of Rock Point School, which is housed in Hopkins Hall, near the vehicle entrance to North Beach. "I always believed, with no foundation whatsoever, that they were made in New York City and transported here at the time the building was constructed [circa 1888]," says Rouleau, who worked at the school in various capacities from 1971 to 2012. A Big Apple point of origin might be a good guess, comments Ribbecke. 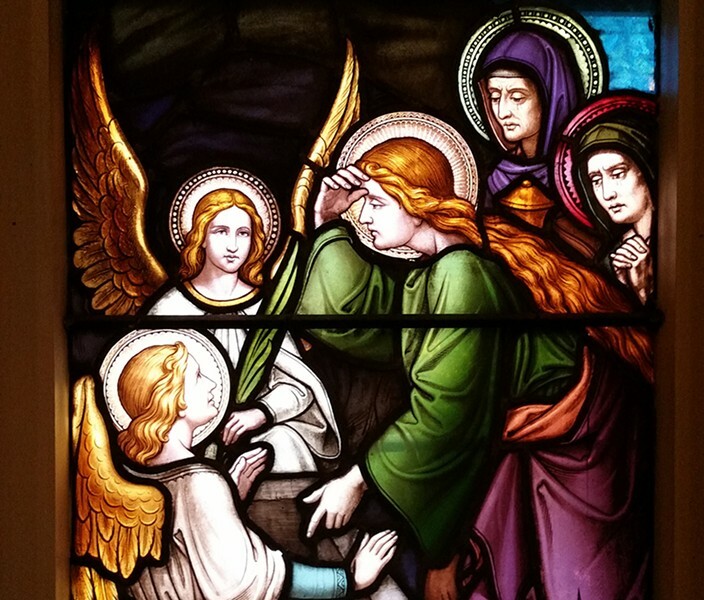 But the stained-glass specialist with a studio on Pine Street speculates that nearby Montréal may be a more likely birthplace for the five windows, which depict the conception, birth, death and afterlife of Jesus Christ. Notable artisans were producing stained glass in Montréal at the time Hopkins Hall was built, Ribbecke notes, but there's no evidence the windows were actually made there. Historical documents of the Episcopal Diocese of Vermont, which owns Rock Point's 146 acres, offer no more help. "There's nothing in the archives about the windows," says Elizabeth Allison, the diocese's historiographer. A few clues can be discerned. The dedications inscribed in gothic lettering at the bottoms of the windows hint at a manufacturing date. The triptych above the chapel's altar, with the infant Jesus and his mother Mary dominating the center panel, includes the epigraph, "In Memory of Melusina, Wife of Bishop Hopkins." John Henry Hopkins (1792-1868), the first bishop of the Episcopal Diocese of Vermont, was married to Melusina Muller, who died in 1884, according to ancestry.com. The couple had 13 children, four of whom are memorialized on the other windows. One of them honors the memory of Caroline Amelia, the couple's fourth daughter, who died in 1907. So the windows must have been installed after that date. Bishop Hopkins himself could not have commissioned the stained glass, having died 20 years before the construction of the building. But Hopkins' progressive politics may well have influenced the windows' subject matter, as well as the function of the building named for him. Hopkins Hall was originally home to a girls' school. 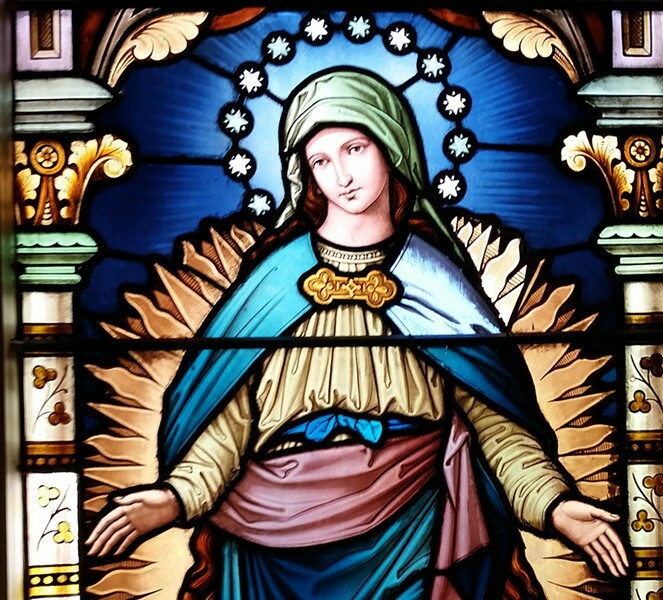 Unusually for the pre-women's suffrage era, females are the main characters in the New Testament scenes depicted on each window. Also notably, the windows are dedicated only to Hopkins' wife and his four daughters, even though the couple had nine sons. "There weren't many places at that time focused on females' education," notes C.J. Spirito, current director of Rock Point School — the coed descendant of the institution founded in 1888. "The scenes in the windows are in support of the effort to put women to the fore." Maybe the stained-glass pieces in the chapel, seldom visited by outsiders, bear some relation to a window in the bishop's private residence, which stands a few hundred yards away. That one — an image of the crucified Christ flanked by saints and angels — has a documented maker. An item in the July 1898 edition of the Mountain Echo, a newsletter published by the Episcopal Diocese, reports that the window in the then-recently constructed bishop's home was "designed and executed by Mr. C.E. Kempe in London, who reproduces the best works of olden days in rich and subdued tones, with exceedingly delicate and accurate drawing." Kempe's name may seem like a promising lead, in that the chapel windows also imitate the artistic style of "olden days" — that of medieval Europe, to be precise, as Ribbecke points out. Online sources say that Kempe was a prominent producer of stained-glass windows whose trademark, affixed to most of his work, was a sheaf of wheat. But alas! No sheaves of wheat are to be seen in the five windows in Hopkins Hall. Some windows made in the late 19th and early 20th century were left unsigned, especially those in the medieval revival style, Ribbecke notes. "Medieval producers would have thought it presumptuous to include their names," and modern manufacturers working in that style followed suit. The artists responsible for the striking designs in the chapel of Hopkins Hall wished to remain anonymous. In 2015, their wish continues to be granted.